I have the privilege of moving my family to a property in Camp Verde that we all love; so much so that we're mentally already living there (now you know my most recent excuse for being spaced out). Our current home exists only as daily comparison to what we are looking forward to. I know that eventually any new home becomes just another place with its own issues. But right now it enjoys the fantasy status of happily ever after. I do have one immediate complaint but I have to qualify it as only being possible because of the blessed life my "complaints" are part of. That said, living in limbo for the three weeks until our new home is available is both minimal and inconvenient. I know. Poor James, right? Most of our things are already packed which leads to lots of, "Do you remember what box ___ is in?" "No. Maybe at the very bottom of that box mountain." "Oh. Hmmm," we answer realizing the odds of finding it don't exist and the odds of getting it repacked correctly are even lower. "I guess I can eat my cold cereal with a plastic fork and cup." It strikes me how straight forward the analogy is between looking forward to a better home here and looking forward to Christ's kingdom. It also strikes me how distant the kingdom can stay in our minds even though it's the eminent destination for all believers. That's not an encouragement to quarrel about who the "real" believers are. It's an encouragement to live with the kingdom in view like it's your next change of address. 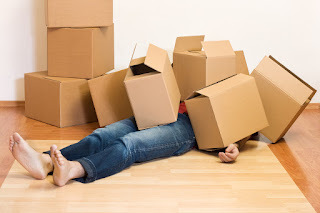 To stretch the metaphor a little further, if you're serious about where you're headed, you will likely find yourself living out of boxes that you can't really unpack until you land there. Feeling a little crazy and homeless are likely as well. I don't actually have a new home until the deal closes but my garage is already full of packed boxes. What if it falls through?! I'm a long ways from "name it and claim it" theology but when my dad told me over the phone to have faith that God was bringing something better, I quipped, "I have a whole garage full of faith!" The Kingdom often seems like that. You know it's real but, if you're still alive, the deals not closed yet. If that rings true, let the good things you've glimpsed but still only dream of owning spur your interest ever deeper into Christ's promises where faith (love followed by action) is the currency of a new world beyond all we can ask or imagine. Until then, you can find me in in Camp Verde.